Cheddar cheese is a relatively hard, off-white (or orange if spices such as annatto are added), sometimes sharp-tasting, natural cheese. Originating in the English village of Cheddar in Somerset, cheeses of this style are produced beyond the region and in several countries around the world. Cheddar is the most popular type of cheese in the UK, accounting for 51% of the country's £1.9 billion annual cheese market. It is the second-most popular cheese in the US (behind mozzarella), with an average annual consumption of 10 lb (4.5 kg) per capita. The US produced approximately 3,000,000,000 lb (1,300,000 long tons; 1,400,000 tonnes) in 2014, and the UK 258,000 long tons (262,000 tonnes) in 2008. The term "Cheddar cheese" is widely used, but has no protected designation of origin within the European Union. 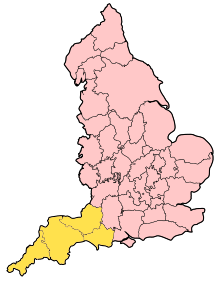 However, in 2007 a Protected Designation of Origin, "West Country Farmhouse Cheddar", was created and only Cheddar produced from local milk within Somerset, Dorset, Devon and Cornwall and manufactured using traditional methods may use the name. Outside of Europe, the style and quality of cheeses labelled as cheddar may vary greatly, with some processed cheeses being packaged as "cheddar" while bearing little resemblance. Furthermore, certain cheeses that are more similar in taste and appearance to Red Leicester are sometimes popularly marketed as "Red Cheddar". The cheese originates from the village of Cheddar in Somerset, south west England. Cheddar Gorge on the edge of the village contains a number of caves, which provided the ideal humidity and steady temperature for maturing the cheese. Cheddar cheese traditionally had to be made within 30 mi (48 km) of Wells Cathedral. Cheddar has been produced since at least the 12th century. A pipe roll of King Henry II from 1170 records the purchase of 10,240 lb (4,640 kg) at a farthing per pound (totalling £10.13s.4d). Charles I (1600–1649) also bought cheese from the village. Romans may have brought the recipe to Britain from the Cantal region of France. Central to the modernisation and standardisation of Cheddar cheese was the 19th-century Somerset dairyman Joseph Harding. For his technical innovations, promotion of dairy hygiene, and volunteer dissemination of modern cheese-making techniques, he has been dubbed "the father of Cheddar cheese". Harding introduced new equipment to the process of cheese-making, including his "revolving breaker" for curd cutting, saving much manual effort. The "Joseph Harding method" was the first modern system for Cheddar production based upon scientific principles. 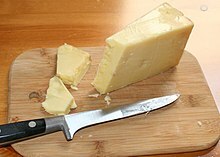 Harding stated that Cheddar cheese is "not made in the field, nor in the byre, nor even in the cow, it is made in the dairy". His wife and he were behind the introduction of the cheese into Scotland and North America. His sons, Henry and William Harding, were responsible for introducing Cheddar cheese production to Australia and facilitating the establishment of the cheese industry in New Zealand, respectively. During the Second World War, and for nearly a decade after, most milk in Britain was used for the making of one single kind of cheese nicknamed "Government Cheddar" as part of war economies and rationing. This almost resulted in wiping out all other cheese production in the country. Before the First World War, more than 3,500 cheese producers were in Britain; fewer than 100 remained after the Second World War. According to a United States Department of Agriculture researcher, Cheddar cheese is the world's most popular variety of cheese, and the most studied type of cheese in scientific publications. 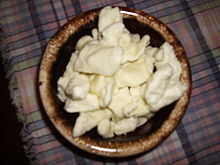 The curds and whey are separated using rennet, an enzyme complex normally produced from the stomachs of newborn calves (in vegetarian or kosher cheeses, bacterial, yeast or mould-derived chymosin is used). "Cheddaring" refers to an additional step in the production of Cheddar cheese where, after heating, the curd is kneaded with salt, cut into cubes to drain the whey, and then stacked and turned. Strong, extra-mature Cheddar, sometimes called vintage, needs to be matured for 15 months or more. The cheese is kept at a constant temperature, often requiring special facilities. 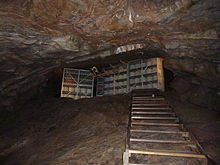 As with other hard cheese varieties produced worldwide, caves provide an ideal environment for maturing cheese; still, today, some Cheddar cheese is matured in the caves at Wookey Hole and Cheddar Gorge. Additionally, some versions of Cheddar cheese are smoked. Cheddar made in the classical way tends to have a sharp, pungent flavour, often slightly earthy. The "sharpness" of cheddar is associated with the levels of bitter peptides in the cheese. This bitterness has been found to be significant to the overall perception of the aged Cheddar flavour. The texture is firm, with farmhouse traditional Cheddar being slightly crumbly; it should also, if mature, contain large cheese crystals consisting of calcium lactate – often precipitated when matured for times longer than six months. Cheddar can be a deep to pale yellow (off-white) colour, or a yellow-orange colour when certain plant extracts are added, such as beet juice. One commonly used spice is annatto, extracted from seeds of the tropical achiote tree. Originally added to simulate the colour of high-quality milk from grass-fed Jersey and Guernsey cows, annatto may also impart a sweet, nutty flavour. The largest producer of Cheddar cheese in the United States, Kraft, uses a combination of annatto and oleoresin paprika, an extract of the lipophilic (oily) portion of paprika. 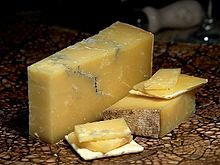 Cheddar cheese was sometimes (and still can be found) packaged in black wax, but was more commonly packaged in larded cloth, which was impermeable to contaminants, but still allowed the cheese to "breathe". The Slow Food Movement has created a Cheddar Presidium, arguing that only three cheeses should be called "original Cheddar". Their specifications, which go further than the "West Country Farmhouse Cheddar" PDO, require that Cheddar cheese be made in Somerset and with traditional methods, such as using raw milk, traditional animal rennet, and a cloth wrapping. The Cheddar cheese name is used internationally; its name does not have a PDO, but the use of the name "West Country Farmhouse Cheddar" does. In addition to the United Kingdom, Cheddar cheese is also made in Australia, Argentina, Belgium, Canada, Germany, Ireland, the Netherlands, New Zealand, South Africa, Sweden, Finland and the United States. Cheddars can be industrial or artisan cheeses. The flavour, colour, and quality of industrial cheese varies significantly, and food packaging will usually indicate a strength, such as mild, medium, strong, tasty, sharp, extra sharp, mature, old, or vintage; this may indicate the maturation period, or food additives used to enhance the flavour. Artisan varieties develop strong and diverse flavours over time. As of 2013, Cheddar accounts for over 55% of the Australian cheese market, with average annual consumption around 7.5 kg (17 lb) per person. Cheddar is so commonly found that the name is rarely used: instead, Cheddar is sold by strength alone as e.g. "mild", "tasty" or "sharp". Following a wheat midge outbreak in Canada in the mid-19th century, farmers in Ontario began to convert to dairy farming in large numbers, and Cheddar cheese became their main exportable product, even being exported to England. By the turn of the 20th century, 1,242 Cheddar factories were in Ontario, and Cheddar had become Canada's second-largest export after timber. Cheddar exports totalled 234,000,000 lb (106,000,000 kg) in 1904, but by 2012, Canada was a net importer of cheese. James L. Kraft grew up on a dairy farm in Ontario, before moving to Chicago. According to the writer Sarah Champman, "Although we cannot wholly lay the decline of cheese craft in Canada at the feet of James Lewis Kraft, it did correspond with the rise of Kraft’s processed cheese empire." Most Canadian Cheddar is produced in the provinces of Québec (40.8%) and Ontario (36%), though other provinces produce some and some smaller artisanal producers exist. The annual production is 120,000 tons. It is aged a minimum of three months, but much of it is held for much longer, up to 10 years. Canadian Cheddar cheese soup is a featured dish at the Canada pavilion at Epcot, in Walt Disney World. Much of the Cheddar cheese in New Zealand is factory produced. While most of it is sold young within the country, the Anchor dairy company ships New Zealand Cheddars to the UK, where the blocks mature for another year or so. Only one producer of the cheese is now based in Cheddar itself, the Cheddar Gorge Cheese Co. The name "cheddar" is not protected by the European Union, though the name "West Country Farmhouse Cheddar" has an EU protected designation of origin, and may only be produced in Somerset, Devon, Dorset and Cornwall, using milk sourced from those counties. Cheddar is usually sold as mild, medium, mature, extra mature or vintage. Mature cheddar is the best-selling variety in the UK. Cheddar produced in Orkney is registered as an EU protected geographical indication under the name "Orkney Scottish Island Cheddar". The state of Wisconsin produces the most cheddar cheese in the United States; other centres of production include: California, Idaho, Upstate New York, Vermont, Oregon, Texas, and Oklahoma. It is sold in several varieties (mild, medium, sharp, extra-sharp, New York-style, white, and Vermont). New York-style Cheddar is particularly "sharp"/acidic, but tends to be somewhat softer than the milder-tasting varieties. 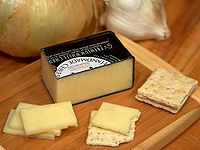 Cheddar that does not contain annatto is frequently labelled "white Cheddar" or "Vermont Cheddar" (regardless of whether it was actually produced there). Vermont's three creameries produce Cheddar cheeses: the Cabot Creamery, which produces the 16-month-old "Private Stock Cheddar", the Grafton Village Cheese Company, and Shelburne Farms. Some processed cheeses or "cheese foods" are called "Cheddar flavored". Examples include Easy Cheese: a cheese-food packaged in a pressurised spray can; also, as packs of square, sliced, individually wrapped, "processed cheese" (sometimes also pasteurised). Cheddar is one of several products used by the United States Department of Agriculture to track the status of America's overall dairy industry; reports are issued weekly detailing prices and production quantities. U.S. President Andrew Jackson once held an open house party at the White House at which he served a 1,400 lb (640 kg) block of Cheddar cheese. The White House is said to have smelled of cheese for weeks. A cheese of 7,000 lb (3,200 kg) was produced in Ingersoll, Ontario, in 1866 and exhibited in New York and Britain; it was described in the poem "Ode on the Mammoth Cheese Weighing over 7,000 Pounds" by Canadian poet James McIntyre. In 1893, farmers from the town of Perth, Ontario, produced "The Mammoth Cheese", which weighed 22,000 lb (10,000 kg) for the Chicago World's Fair. It was planned to be exhibited at the Canadian display, but the mammoth cheese fell through the floor and was placed on a reinforced concrete floor in the Agricultural Building. It received the most journalistic attention at the fair and was awarded the bronze medal. A larger, Wisconsin cheese of 34,951 lb (15,854 kg) was made for the 1964 New York World's Fair. A cheese this size would use the equivalent of the daily milk production of 16,000 cows. 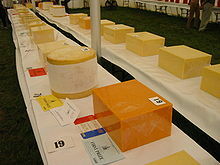 Oregon members of the Federation of American Cheese-makers created the largest Cheddar cheese in 1989. The cheese weighed 56,850 lb (25,790 kg). ^ a b Smale, Will (21 August 2006). "Separating the curds from the whey". BBC Radio 4 Open Country. Retrieved 7 August 2007. ^ "The Interview – Lactalis McLelland's 'Seriously': driving the Cheddar market". The Grocery Trader. Retrieved 9 May 2007. ^ "Cheese Sales and Trends". International Dairy Foods Association. Archived from the original on 19 May 2011. Retrieved 9 November 2010. ^ "Quantity of cheddar cheese produced in the U.S. from 2004 to 2013 (in 1,000 pounds)". Statista. Retrieved 19 December 2015. ^ a b c Rajan, Amol (22 September 2009). "The Big Question: If Cheddar cheese is British, why is so much of it coming from abroad?". The Independent. London. Retrieved 9 November 2010. ^ "West Country Farmhouse Cheddar”, gov.uk. ^ "History". Cheddar Gorge Cheese Company. Archived from the original on 2 August 2009. Retrieved 1 August 2009. ^ Barthélemy, Roland; Sperat-Czar, Arnaud (2003). Guide du fromage: Choisir, reconnaître, goûter 1200 fromages du monde. p. 89. ISBN 978-2-01-236867-5. ^ a b "Encyclopedia – Harding, Joseph". Gourmet Britain. Retrieved 23 June 2009. ^ Blundel, Richard; Tregear, Angela (17 October 2006). From Artisans to "Factories": The Interpenetration of Craft and Industry in English Cheese-Making 1650–1950. Enterprise and Society. ^ "Government Cheddar Cheese". Practically Edible. Retrieved 30 April 2011. ^ Potter, Mich (9 October 2007). "Cool Britannia rules the whey". Toronto Star. Retrieved 4 January 2009. ^ Tunick, Michael H. (23 February 2014). "The biggest cheese? Cheddar". The Boston Globe. Retrieved 24 February 2014. ^ a b Mount, Harry (18 June 2005). "Savvy shopper: Cheddar". The Daily Telegraph. London. Retrieved 10 March 2008. ^ "Information Sheet – Cheese & Rennet". Vegetarian Society. Archived from the original on 27 March 2008. Retrieved 10 March 2008. ^ Kelly Jaggers, Moufflet: More Than 100 Gourmet Muffin Recipes That Rise to Any Occasion, p. 104. ^ Karametsi, K. (13 August 2014). "Identification of bitter peptides in aged cheddar cheese". Journal of Agricultural and Food Chemistry. 62 (32): 8034–41. doi:10.1021/jf5020654. PMID 25075877. ^ Phadungath, Chanokphat (2011). The Efficacy of Sodium Gluconate as a Calcium Lactate Crystal Inhibitor in Cheddar Cheese (Thesis). University of Minnesota. Retrieved 12 October 2013. ^ Aubrey, Allison (7 November 2013). "How 17th Century Fraud Gave Rise To Bright Orange Cheese". The Salt. NPR. ^ Feldman, David (1989). When Do Fish Sleep? And Other Imponderables of Everyday Life. Harper & Row, Publishers, Inc. p. 15. ISBN 978-0-06-016161-3. ^ Blulab sas. "La Fondazione – slow food per la biodiversità – ONLUS". Slowfoodfoundation.org. Archived from the original on 15 May 2006. Retrieved 23 June 2009. ^ "Presidia Artisan Somerset Cheddar". The Slow Food Foundation. Archived from the original on 25 August 2007. Retrieved 9 May 2007. ^ "Australian Dairy Industry" Archived 2 November 2014 at the Wayback Machine. dairyaustralia.com. ^ a b "Manufacturing Taste". thewalrus.ca. ^ "Types of Cheddar cheese, Canadian Living". CanadianLiving.com. Archived from the original on 1 May 2016. ^ "Recipe for Canadian Cheddar cheese soup at Epcot". ^ a b Ridgway, Judy. The Cheese Companion. Running Press, 2004, p. 77. ^ "Cheddar Gorge Cheese Company". ^ "EU Protected Food Names Scheme – UK registered names". Department for Environment, Food and Rural Affairs. Archived from the original on 31 July 2009. Retrieved 22 July 2009. ^ Hale, Beth. "Mature-cheddar-cheese-sales-soar-curry-loving-Britain-gets-taste-stronger-food". The Daily Mail. London. ^ "entering a name in the register of protected designations of origin and protected geographical indications (Orkney Scottish Island Cheddar (PGI))". Official Journal of the European Union. Retrieved 19 March 2014. ^ "Andrew Jackson". The Presidents of the United States of America. The White House. Retrieved 24 October 2008. ^ "McIntyre, James". University of Toronto Libraries. Retrieved 15 January 2013. ^ McNichol, Susan. "The Story of the Mammoth Cheese". Archives of the Perth Museum. Retrieved 15 January 2013. ^ "Mullins Wisconsin Cheese". Mullins Cheese. Retrieved 15 January 2013. ^ "Cheddar Cheese and Cider Farms". Gorges to visit. Archived from the original on 16 February 2013. Retrieved 15 January 2013.